Ok - here is my third and final post about the National over the weekend. Feel free to go back and read about the vintage and the hits. Today, let's just talk about what I saw. As I mentioned in the first post, the sheer size of the card show was a lot to take in. I have been to the Rosemont convention hall in the past so I know the rough size. 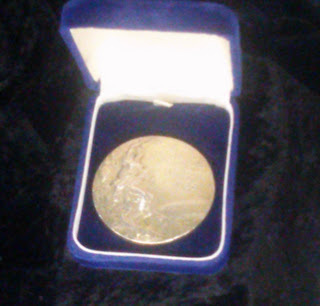 I guess when you are used to the small LCS or a 70 table show, getting that many in one room takes your breath away. I remembered a couple times to pull out my phone and snap a pic or two, but unfortunately, I didn't do it enough. 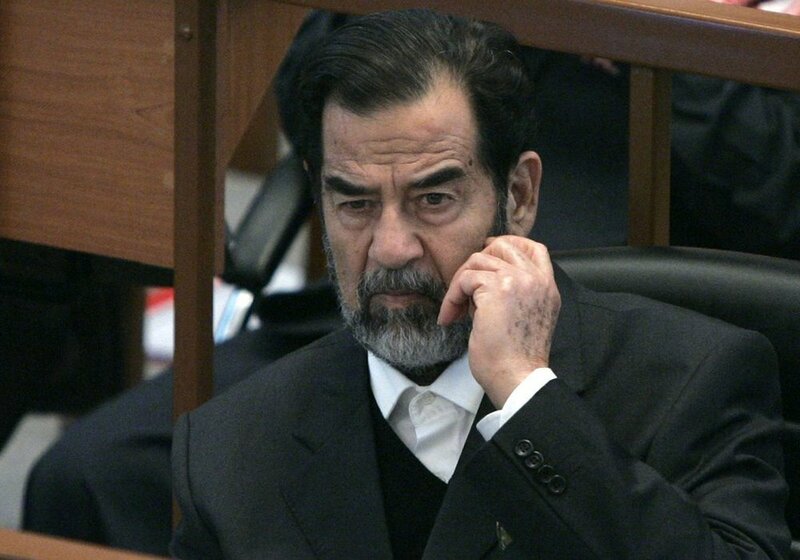 I'm digging on the net for pictures from other people/sites, and I will give credit where credit is due. No credit - cash only! 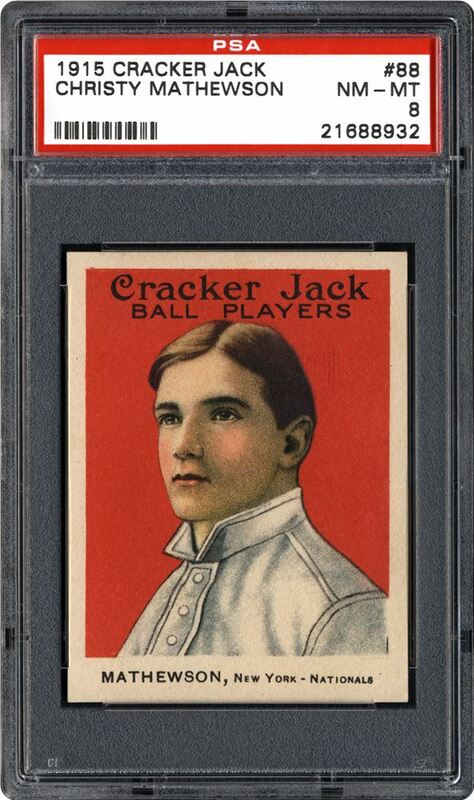 Along with being a card show, the National is a bit of a Hall of Fame, from what you see in the numerous vendors. I have yet to get to Cooperstown, but a bit of that came to me. One auction house, SCP Auctions, is putting this on the block. 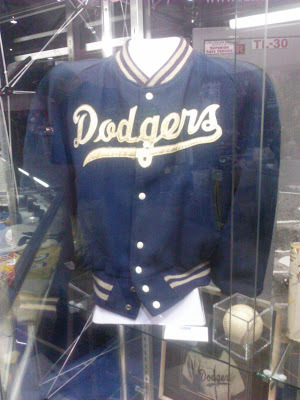 It's billed as Jackie Robinson's team jacket. You can see an autographed ball just to the right. Not the best of shots with the lighting, but what you see is one of Jesse Owen's gold medals from the 1936 Olympics in Berlin. To have history that close to your face takes your breath away. 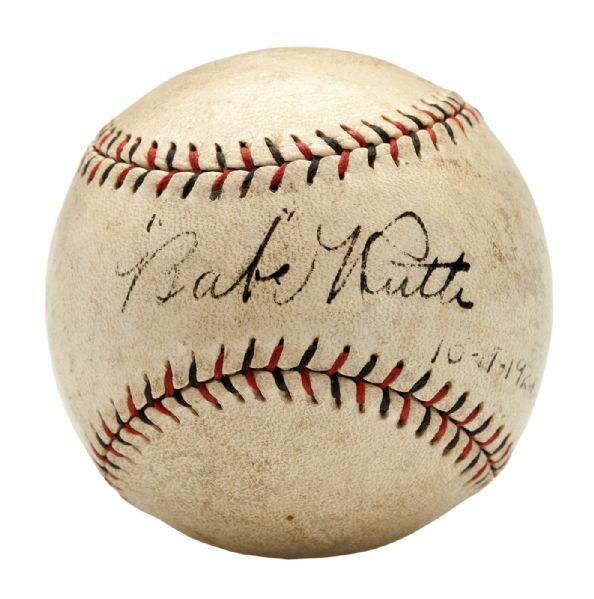 I snagged this image from SCP Auctions website, but I did see this ball, along with a whole ton of others signed by the Babe in one case. 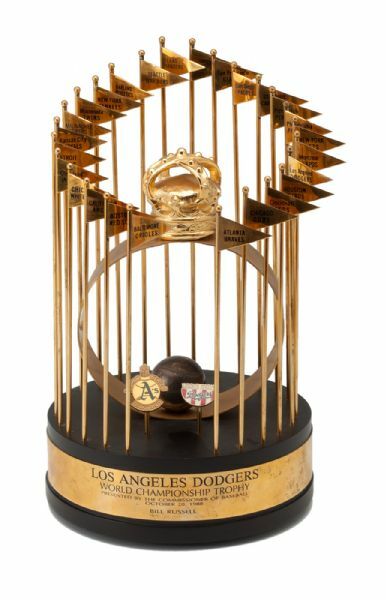 For you Dodgers, you can pick up Bill Russel's '88 World Series trophy. Mears Auctions was also there. I really regret only snapping this one picture, because their website is not showing was I got to see, like a game used Seattle Pilots uniform, Washington Senators from the mid 20's and a host of others. 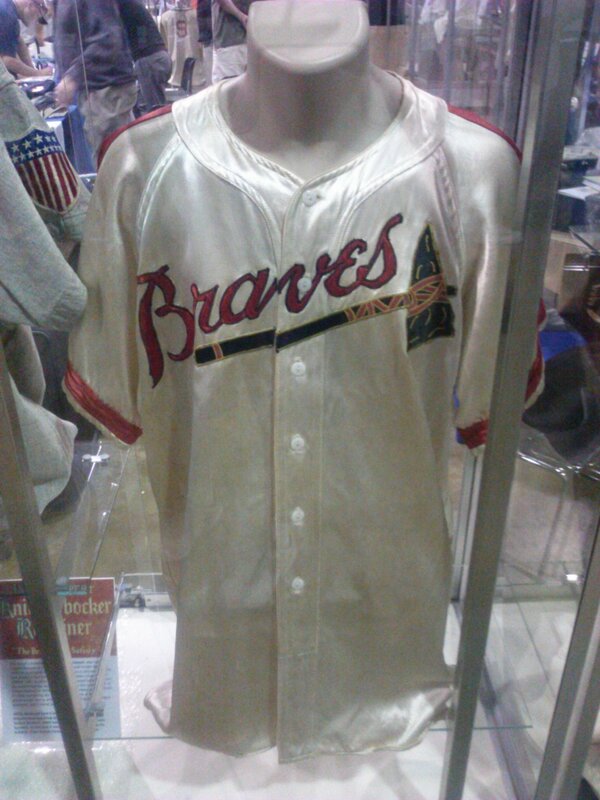 But I think you will appreciate this night time Spahn satin jersey. Oh dear....just lovely. People were other sights at the show. People like Nick from Dime Boxes and Julie from Funner Here. I was able to find them and we had a chit chat about our finds. Julie was old hat at the Nationals, so I think she had inner joy at the looks of shock and awe from Nick and I.
Luckily, Julie was able to snap at least one great image of cards available at the National. I walked by that case. And stared. And was too blown away to pull out my phone. PSA was at the show and there was a TON of Cracker Jack cards there, like this one (that I grabbed from their website). I had never seen so many Cracker Jack cards in one place. The only other picture I took was this one. Julie had a few extra auto tickets she wasn't going to use, so she was kind enough to give me Murray's. 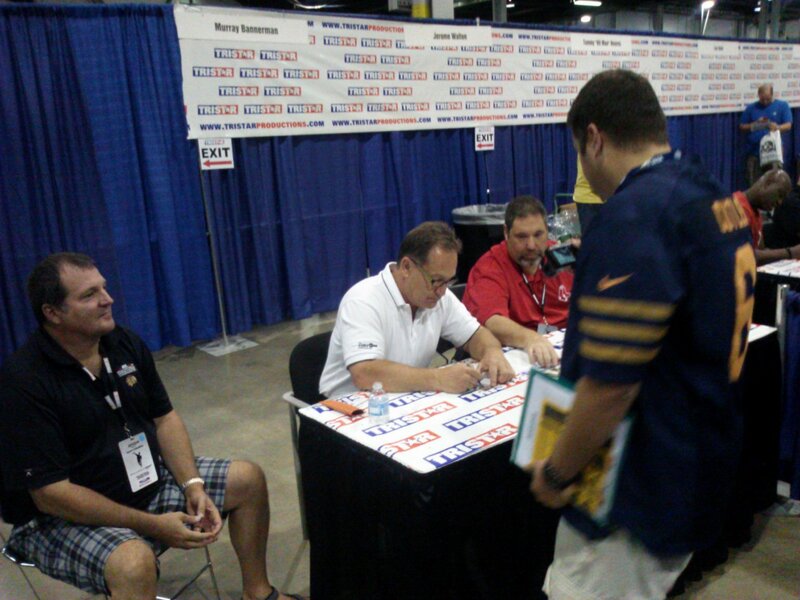 To the far right of that image you can see the Cubs Jerome Walton signing. While waiting in line, they also had the Goose, "No Mas" Roberto Duran, Chippah, Lou Holtz, Hit Man Hearns and others at the tables. Murray was all I needed. I am finally recovering from all the standing and walking. And I am gearing up for next year's National. Cleveland - I should be there. I may have to strategically plan a road trip to Cleveland right around National time next year. This weekend's show was an absolute blast, to say the least.